A slight digression this week from the normal neon fare to visit upon another threatened icon of the New York Landscape. 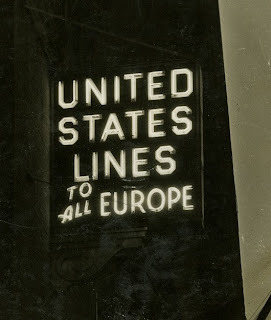 Over at the Pier 76 tow pound on Manhattan's west side, long-dark neon signage recalls the once formidable United States Lines. 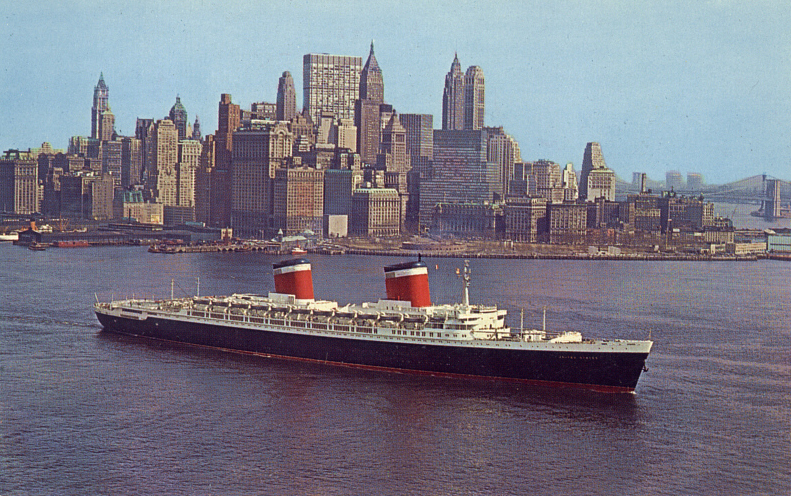 The company's flagship, the SS United States, was a fixture on the New York waterfront from its maiden voyage in 1952 until 1969. The SS United States exemplified the point-to-point ocean liners that were character-defining features of the city's harbor for decades, until jet aircraft rendered them obsolete as basic transportation in the 1960s. 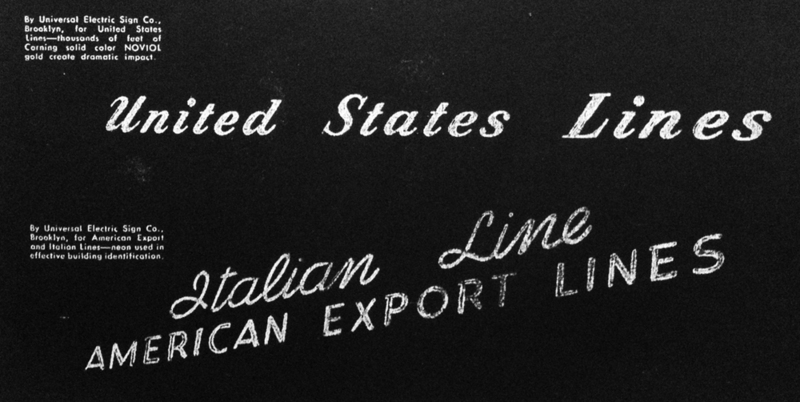 Above: US Lines neon at Pier 76, still in situ after all these years. One of the "I"s came alight each night until a few years ago. (T. Rinaldi) Below: as often depicted in old postcards, the SS United States were features of the New York skyline for decades. Remarkably, the SS United States survives today, now one of the very last ships of her kind anywhere in the world. A nonprofit called the SS United States Conservancy has taken stewardship of the vessel (now idle at Philadelphia) with an eye toward preserving the ship as a stationary historic site, ideally at an underutilized pier in her former home port of New York. But time is money, and the Conservancy needs more time – and money – to keep the SS United States afloat until a deal can be struck to re-purpose and restore the ship. In this season of tax deadlines and Titanic anniversary tributes, please consider making tax-deductible contribution to help save "the most famous ship that didn't sink," a New York landmark in exile. • Heartwrenching news from the Upper East Side via ProjectNeon - Cork and Bottle liquors has ditched their great old signs for plastic replacements. • More bad liquor news from Midtown: JL Liquors, on East 34th Street, one of my favorites, has gone LED. • I am told that the Manhattan Furrier sign over in Greenpoint, Brooklyn, is a gonner. Can anyone confirm? • Now, the good news: the Langdon Florist sign down on Reade St. has been restored by Paul Signs of Brooklyn. • Stay tuned for details on the pending restorations of the Long Island Restaurant and - yes, at last - Circo Pasticceria signs in Brooklyn! 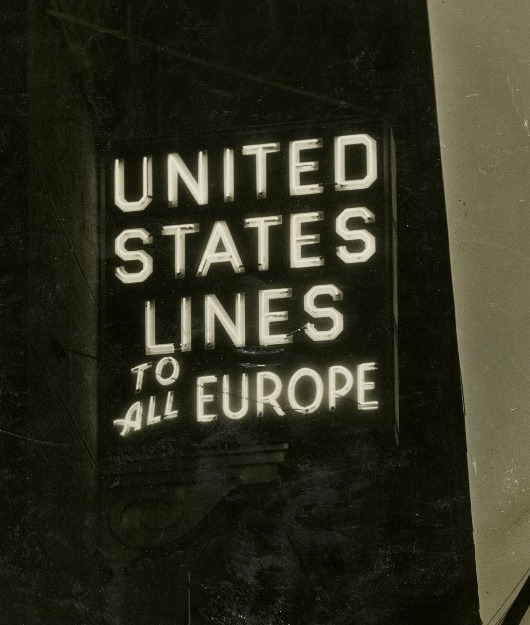 • "Flickering Light," a new book from author Christoph Ribbat, takes on the whole big crazy history of neon. • RESCHEDULED: my walking tour of Upper West Side neon was mercilessly rained out! The tour will take place on Weds 5/1/13; see the West Side Rag for details (ignore the date at this link). • July 22, 2013, at the NYPL / Mid-Manhattan Branch.